In the context of family business, the topic of succession is considered a problem child. Many families dread the transition period from one generation to another, as it is well known that it requires a strong combination of emotional and managerial qualities. For the family business leadership succession is considered the ultimate challenge; it encompasses the needs of stakeholders, family members, and also tests the vision of the company as a whole. Added to these challenges are issues relating to culture, mentality, and traditional ways of doing business. But how much of the negativity surrounding succession is due to a collective negative anticipation? Can succession, through a thorough preparation and a change of perception, become a positive phase that gives the business momentum instead of representing a dreaded obstacle threatening continuity? It becomes clear that breaking down the succession process and looking at it from various angles takes away much of its perceived threat and might make it a manageable challenge. Almost everybody who has ever written anything about family-owned companies pinpoints succession as the core challenge in family business securing continuity. The transition period from one leadership to another may well involve more emotional effort from the family than any other phase in the family business’ history. While the challenges are real, however, the succession "scare" may also partly be due to a collective negative perception and trembling expectation, influenced by stories of families that failed and statistics that emphasise the vulnerability of families in moments of transition. But succession is not "one moment", or "one document" and it does not mean that a father tells his son "here’s the key, now I’m out"! On the contrary, succession is a long, rather opaque phase that starts from the day the next generation shows an interest in the business. Finding an end point to succession is difficult, too, as whilst some technical, legal procedures may clearly have an end to them, the emotional and intellectual influence of the previous generation may well carry on. This shows that it is essential for families to break down the succession process into a overseeable process, get the toolkit out, and get ready to take action as soon as possible. The high pressure, different expectations, and subsequent emotional strain on the family in phases of transition sometimes takes away the attention from the organisational aspects that need to be addressed. So, some families tend to be absorbed by personal aspects of the succession process. As understandable as this is, it is an obstacle to making important corporate and operational changes to support a new leadership and ownership structure. Other families will focus purely on the technical part of succession and may underestimate the emotional adjustments that need to be achieved in order to implement revised corporate strategies and family structures. Focusing exclusively on either the technical or the emotional side of a transition period can get a family stuck! These are the situations where transition from one generation to another can turn out to be a nightmare for the family, the business and all the stakeholders. Succession can only be successful when firstly, there is a clear, long-term vision by the generation in charge on how succession should be handled and secondly, when both the technical and emotional aspects are equally taken care of and understood by all participants. The technicalities of succession demand a lot of financial resources and often put a strain on the human resources management. The implementation of new structures demands self-discipline and a thorough follow-up by all involved family members and understanding from the senior non-family management. Therefore, it is useful to prepare the family bit by bit to go through changes and learn to implement them, as certain measures may require a certain adaptation in the mindset of family members. In order to avoid that families end up with a large pile of very expensive and elaborate documents that are not used or implemented, it is important that all documents relating to succession are user-friendly and understandable. • The perceived and real generational gaps that naturally occur through differences in education and technological know-how. • Miscommunication between family members based on missing job descriptions and falsely attributed responsibilities. • Existing family conflicts that impact on the business. • Favouritism of one or several family members by the family leaders. Managing the emotional challenges surrounding succession, is not something that only depends on top management. The whole family needs to make an effort to recognise signs of misunderstandings and conflicts. How well these efforts are rewarded will depend on how constructively a family succeeds in communicating with each other and also non-family employees. Fact is that emotional and technical dimensions of succession are inextricably linked. Either side has an immediate effect on the success or failure of the other. Another highly relevant question that often arises in succession is who should be involved in the planning and the management of it. Should it only be a matter of those family members that are active in the company? Or should other family members get a say in these matters as well? Sometimes, family members, who are not active in the business, can have a great influence on the organisation of the succession and make is successful by taking on so-called mediator roles. Furthermore, succession does not only concern the leadership level of the family business. Involving the successors in decisions relevant to succession at an early stage does not only prevent conflict but also prepares the next in line for their responsibilities. When speaking of succession in Arab family businesses, we have to take into account that the region’s social and cultural life and history strongly influence the family and thus the corporate structure. Middle Eastern family businesses, especially in the Arabian Gulf countries, have a tendency to have a rather extensive horizontal diversification of their businesses. On the one hand, this creates many opportunities to include the next generation into the business. If many industries are represented, chances are higher that family members will find one or the other activity within the business that suits them. Some families expanded in this way especially to create these opportunities for their family members. To give all family members a chance to join and to create opportunities for various interests may be a good way to keep family cohesion and to motivate the next generation. On the other hand, large and highly diversified conglomerates tend to complicate things and render succession planning more challenging. Another particularity in the Arab world is that the age difference between generations may be smaller than, for example in Western families. The immediate result of this is that family businesses may end up having 3 generations active in the business at the same time. This means that the succession must be an ongoing process and clearly structured and anticipated, depending on the family’s particular demography. Opportunity and challenge at the same time, in a demographically complex family business the solidarity between generations may be greater or lesser depending on how the relationships between family members are managed. Furthermore, the traditionally strong ties of Arabian family businesses with their immediate social environment and community are a highly relevant factor when speaking of succession. The image and name of the family is intrinsically linked with the strength of its brand. Succession problems and conflict in the family will thus have a direct impact on the commercial success and stakeholder trust in the business. Finally, the Arab world in general currently witnesses a rather large generational gap. Through the exponential growth of some Arab markets, the Internet and international exposure, the younger generation in the Arab world was partly raised in an atmosphere quite different from their parent’s. This can lead to misunderstandings, whereby innovation from the younger generation is being regarded as not realistic and on the other hand the wisdom of the senior generations is perceived as uninspired. The link of a family businesses with society, the size and demographic of the family, the degree of diversification and the generational gaps in a family are all factors that Arab family businesses need to consider, when speaking of succession. It also shows that it is strategically important to have advisors and to develop systems that are adapted to the cultural challenges facing Arab family businesses. Of course, the factors composing succession are more complex than the ones we mentioned and vary greatly from family to family and business to business. However, what is the most relevant thing is that families should not fall into the trap of premature negative perception. Instead of seeing it as a threat, families should break the process down into understandable portions and even try seeing it as an opportunity: It might become a momentum for great innovation, a basis of growth for the business and consolidation of the family. Instead of seeing it as the most fragile moment in your family business continuity, seeing it as the moment that gives you the most drive for growth. Arab family businesses have a tremendous potential by often being numerous! This is an additional challenge but also a great asset meaning that much of the needed innovation and leadership competencies can be found or easily developed within the family. However, if succession continues to be a topic that is dreaded it will always end up being a self-fulfilling prophecy; negative and frustrating. In order to strike the balance between technical and emotional factors involved in succession, Arab family businesses need to come up with their own customised framework instead of trying to apply ready-made templates from existing organisational structures. There is an amount of effort required and certainly much can be learnt from others, however, the family’s willingness to carry on is the major determinant of family business continuity and cannot be substituted by any type of technical document. How a family business achieves this balance/ framework is individual. Some may need outsiders such as non-family employees to help generate the professional mindset that succession requires, and to create the space for the new comers to be able to start their role unencumbered by predecessors. Others may very well find the solution within and come to easy agreements within the family taking into account individual wishes. Succession is a project that needs management, anticipation, and clearly defined milestones. How well succession is managed can only be measured through family member satisfaction and business age. 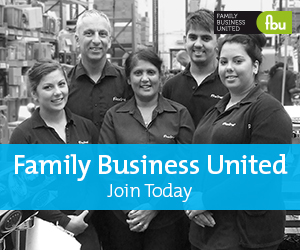 It should be an intrinsic part of family business strategy.